Gary Anderson is in a strong position to seal a play-off place. He starts the night three points ahead of fifth-placed Daryl Gurney who plays Michael Smith earlier in the evening. Should Gurney defeat Smith then Anderson’s lead will be down to one point with Anderson facing Van Gerwen in his final league match next week. If Gurney has lost to Smith earlier then Anderson will already be assured of a play-off spot. Anderson was defeated 7-5 by Simon Whitlock last week in Manchester having missed a dart at a double for a point. That defeat was only his second loss in his last 11 Premier League matches. The Flying Scotsman has hit 16 ton plus finishes during the tournament, with only Van Gerwen managing more during the 2018 Premier League. Raymond van Barneveld is unbeaten during his last three Premier League matches; he backed up his win against Michael van Gerwen by drawing 6-6 against Rob Cross last week in Manchester. With the play-offs out of reach, the focus for Barney now is to try and leapfrog Daryl Gurney into fifth place, as doing so would mean an extra £10,000 of prize money for the Dutchman. When Van Barneveld and Anderson met earlier on in the 2018 Premier League, Barney missed five darts to win the match 7-4, and, in the end, had to settle for a 6-6 draw and a share of the points. The outcome of the match between Daryl Gurney and Michael Smith earlier in the evening could have a huge bearing on how much pressure Anderson is feeling during this encounter. Should Gurney cut the gap to one point, Anderson will need to win or draw this match to avoid possibly needing to pick something up from his match against Van Gerwen next week. If Anderson’s spot in the top four is already confirmed prior to this match the pressure is off, and how motivated Anderson will be remains to be seen. All of this makes the outcome here tricky to assess; Anderson looked in red hot form in Rotterdam two weeks ago but his level dropped against Whitlock last week. 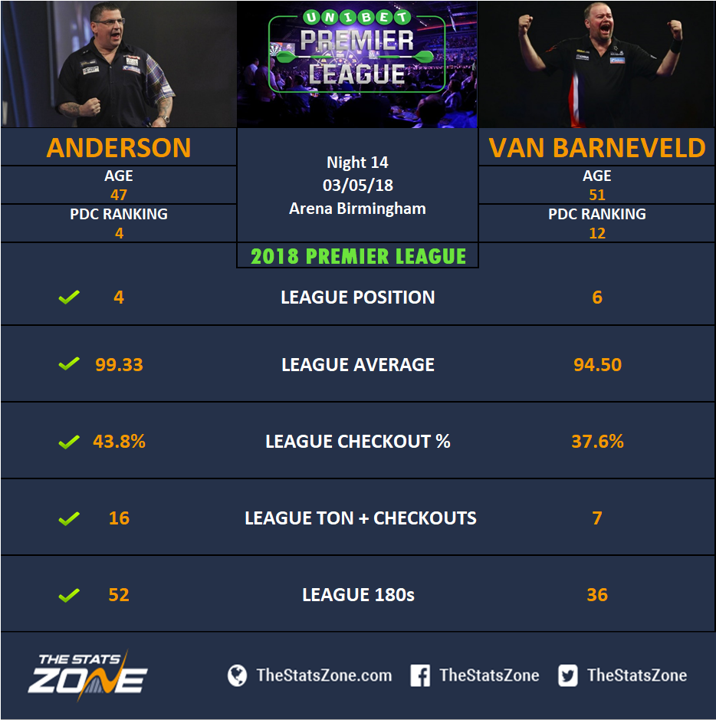 Barney is playing for pride and has shown some good fight over his last three matches and is unlikely to roll over for the Scotsman but Anderson might just have enough to edge out the Dutch legend.